Back in the early '70s, when I was a teenager, my parents gave me the chance to see R-rated movies if I had read the book the movie was based on and could show a reasonable understanding of the subject matter. I read The Godfather and saw the movie, another was The Last Picture Show and yet another was The Exorcist. I remember the release of The Exorcist as a nationwide sensation in 1973. There were stories of terrified movie-goers fainting, throwing up and running out of theaters. My father and I stood in line for more than three hours to see this horror extravaganza. Indeed, at the showing I attended, there was crying, shrieking and people running out of the theater during the film. I admit that I was scared and I have always rated The Exorcist as the scariest movie of all time. I certainly saw some outrageous and shocking things that I had never seen before or since in any other movie. Now more than 25 years later, The Exorcist is being re-released to the theaters with never-before-seen footage that is supposed to bring the movie closer to the vision of author William Peter Blatty. I believe that some of the genesis of this new version for 2000 came form the The Exorcist 25th Anniversary Special Edition DVD release. It is a fascinating feature of this edition to have the various interview segments and separate audio commentaries that allow director William Friedkin and producer-writer Blatty make their case for their vision of the movie. When The Exorcist was in production, Friedkin was riding high on the Academy Award®-winning success of one of the top films of all time, The French Connection. Blatty was an experienced screenwriter although known for much lighter weight material including A Shot in the Dark from 1964 and The Great Bank Robbery in 1969. In the commentary and interviews, it becomes clear that this version is the vision of Friedkin. His pull at the studio allowed him the power to make the key casting decisions, order an extensive rewrite of Blatty's original script, establish the tone of the movie and make the final editing decisions. This Special Edition is introduced by Friedkin and he uses this opportunity to lay the foundation of his interpretation. He states, "Over the years, I think that most people take out of The Exorcist what they bring to it. If you believe that the world is a dark and evil place, then The Exorcist will reinforce that. But, if you believe that there is a force for good that combats and eventually triumphs over evil, then you will be taking out of the film what we tried to put into it." Against Friedkin's stance of an open interpretation of the spiritual essence of the film, Blatty argues for a more explicit explanation of the specific meaning of the events in an interview segment entitled Stairway to Heaven, featuring a deleted scene from the film. In explaining why he wants the more obvious meaning, Blatty says, "[It] gives you a core, a reason why all of it, let's face it, the shock and obscenity that are in the film and the book are taking place. It allows the audience to not despise itself for loving all of that shock, all of that obscenity, and all that torture of the little girl... they can enjoy the film for what it is and not revile themselves." In reading some of the descriptions of the new version of The Exorcist released this year, there are indications that Friedkin has come over more to Blatty's argument. But that is a discussion for another time; now is the time to take a look at The Exorcist 25th Anniversary Edition. Excepting people who would not own The Exorcist because of the graphic nature of its content, this disc is a must have for any cinema fan. Viewing the beautiful, crisp digitally-remastered version of the film or exploring the varied extras allows an in-depth reflection on the nature of good and evil, spirituality and religion. The disc allows you to participate in a filmic phenomena that is guaranteed to frighten, disturb and overwhelm you. The film itself is so professional and powerful. It utilizes special effects that truly stand the test of time and technological progress. The script is remarkably well written with dialogue that is revealing and believable without a false note. The acting performances featuring fresh, unfamiliar actors mixed with those of more experience has a realism of portrayal that very few movies have ever approached. The editing is powerful, the music is sublime and the production design leaves no detail ignored. Simply stated, The Exorcist is one of the most "well-made" films in the history of cinema. This leads one to the story that this exquisite piece of film production tells—The Exorcist is a horror film. But its documentary-style realism and outstanding production quality take it past all other "shocker" movies ever made. Living with her actress mother, Chris MacNeil (Ellen Burstyn), in the Georgetown area of Washington D.C., 12-year-old Regan MacNeil (Linda Blair) begins to exhibit unusual behaviors that are attributed to "nervous disturbance." Doctors submit the girl to a horrific series of physical tests on the premise that the cause of her behavioral changes are somatic problems in the brain. Regan gets progressively worse and psychiatrists are brought in with no positive results. With a backdrop of increasing paranormal activity, Regan has metamorphosed into a terrifying caricature of herself. She is physically abusive, shockingly profane, disturbingly blasphemous and the minions of medical science are at a complete loss. On the possibility of schizophrenia, a psychiatrist speaks "to the person inside Regan" and it begins to appear possible that this little girl is literally possessed by a demon. With no physiological or physical explanation, the doctors recommend, as a last resort, that Chris should consider what they call "shock therapy"—an exorcism. She contacts a priest at the nearby university, Father Damien Karras (Jason Miller) who is also a trained psychiatrist, and casually drops the question into their conversation: "How does one go about getting an exorcism?" Karras replies that they would have to get into a time machine and travel back to the 16th century because that sort of thing doesn't happen anymore. Chris' obvious desperation convinces Karras to visit Regan "as a psychiatrist." Up to this point In the film, there has been a parallel storyline following Karras through his life. He watches Chris at work filming her movie at the University, she sees him at work and his friend Father Dyer is a guest at a pivotal dinner party at Chris's house. Karras is seen struggling with the difficulties of dealing with his aging mother and his own crisis of faith as a psychological counselor to other priests. These scenes are all a part of the excellent storytelling techniques used in the first hour of this film to create a universe for the audience in which the incredible supernatural events of the second hour appear so much more horrible and so frighteningly plausible. The character development is very refined and the multi-layered plot, including the investigation of events surrounding the house by police detective Lt. Kinderman (Lee J. Cobb), is totally believable and potent. The Exorcist received an Oscar® for Best Adapted Screenplay. Karras interviews the changed Regan in an attempt to determine if it is even feasible to consider something like exorcism. We follow his struggle with the malevolent "demon" inside Regan and finally join with Karras and Father Merrin (Max Von Sydow)—an aged priest experienced in exorcism—into the ultimate battle between good and evil. The sequence of events, involving characters we know so much about, are powerful and overwhelming. The movie loses little of its potency on the small screen. 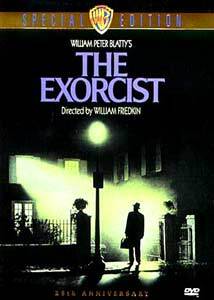 The Exorcist received 8 other Oscar® nominations in 1974 including Best Actress (Burstyn), Best Supporting Actor (Miller), Best Supporting Actress (Blair) and Best Director for Friedkin. The film also was nominated for Best Art Direction, Best Cinematography, Best Film Editing and Best Picture. This DVD release is a great presentation of the movie and the extensive, unusual extras add great enjoyment. It is good to have a version of the film as it was originally released in such pristine quality. After viewing the plethora of examinations of the film in the commentaries, interviews and the documentary, I re-examined my own feelings about the "message" of The Exorcist. I never found it to be a spiritually deep film and I find some of the discussion about what it means philosophically to be somewhat self-serving on the part of the creators and participants. Perhaps they are embarrassed about some of the film's historical status as the "greatest horror film ever made" and want it to be more. They want it to be a statement about the triumph of good over evil to gain a measure of respectability in the court of public opinion. Perhaps Blatty is correct—that the deletion by Friedkin of some important scenes reduced the ultimately positive message—and their restoration will change the "importance" of The Exorcist as an examination of spirituality. That's fine for their perceived place in history, but I will continue to enjoy the original version (oddly, a "director's cut" that has fewer scenes) as the scariest movie I have ever seen. Image Transfer Review: The image transfer for the Exorcist is truly a treat to behold. With a film as old as The Exorcist, problems can often crop up in the digitization. Technology of 25 years ago can also be found wanting in the unwavering digital eye. It is a tribute to the quality of this film that neither is true. If anything, it is similar to many DVDs of great quality that in many ways you are seeing the film as you have never seen it before. Director William Friedkin supervised the production of this edition, including restored picture elements, and it shows. Ellen Burstyn says in the documentary, "My friend Billy Friedkin is a maniac." If any of the stories about Friedkin as director are true, one can only imagine the attention to detail that this transfer received. The DVD is also enhanced for display on 16X9 TVs. Audio Transfer Review: The Exorcist received an Oscar® for sound in 1974. The production of the original film required 16 weeks to nail down the soundtrack. With supervision by Friedkin, this release establishes a standard for Dolby Digital 5.1 remastering and transfer of audio to DVD. There is no doubt that the sound design of The Exorcist is absolutely crucial to the full experience of the film. Alternating between dead silence and astonishing sound explosions, combined with dialogue that is quiet one moment and shrieking the next, the remix does an outstanding job of filling the speakers and showing off one of the finest horror soundtracks ever created. Extras Review: Viewing many DVDs can make one get kind of jaded about extras on the disc. The Exorcist restores one's faith in the concept as the extras here are fantastic and add greatly to the enjoyment of the film. The most unusual extra is the Sound Effect Tests that shows the development of the demon voice by Mercedes McCambridge, found following writer William Peter Blatty's audio commentary. These might only be listened to once, but they are a tribute to a great vocal actress. It is fascinating, as well as frightening, to listen to her reading both parts of the interview scene between Karras and the demon and create the sounds that we eventually hear on the screen. The BBC documentary The Fear of God: 25 Years of The Exorcist is a perfectly excellent 75 minutes of revealing interviews, reminiscences, examinations and explorations featuring many of the cast and crew of the original film. The show is filled to the brim with fascinating tidbits. The documentary also includes many of the deleted scenes that are scheduled to be added back into the film for its new release. There are also makeup test, screen tests and special effects tests shown in the documentary. Absolutely an essential for fans of The Exorcist. The documentary has scene access with 23 cues. The separate audio commentaries of Friedkin and Blatty are both fascinating and revealing, each discussing the film from his own perspective. Friedkin gives excellent insights into the making of the film itself along with interesting trivia. Blatty provides a historical context for the story as well as interesting takes on the genesis of the book and the reactions he has had from fans and critics. They continue the dialogue that marks this edition about the ultimate message of the film. In addition, there are production sketches, filmographies and a fascinating little bit call Exorcist: The True Story, which portrays some of the known factual elements of the purported exorcism in 1949 that ultimately inspired Blatty to write the novel. Excellent quality transfers, a great selection of extras and one scary film make this an essential for any DVD collector. Besides being a great horror film, The Exorcist is a landmark piece of American cinema.